A variety of sprouted seeds. Growing your own sprouts is a good way to eat fresh and save money. It is simple to do, only takes a few days, and the variety is almost limitless. 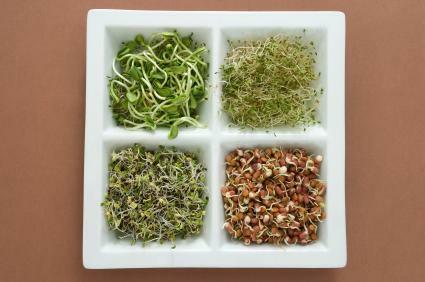 There are many reasons for growing various types of sprouts. They are a delicious and healthy addition to many recipes and they are packed with vitamins, minerals and antioxidants. Because they are living foods sprouts retain a high level of their nutritional value. People who live the vegetarian lifestyle often depend on these nutritional powerhouses as a healthy addition to their diets all year round. All sprouts are grown in the same manner as other sprouts. You must go through the same steps whether you grow alfalfa sprouts or pumpkin sprouts. The major difference is going to be in the time needed for sprouting. Some seeds, like alfalfa, sprout quickly and are ready for eating in three days or so. Others, like garlic, may take as long as three weeks to completely sprout. For best results follow the directions on the package.It is important that you buy sprouting seeds from a reputable company. Make sure that they are seeds that have been gathered specifically for sprouting. It is best of they are organic as well. When you decide on growing your own sprouts, you may have a difficult time finding seeds for sprouting. Many health food and specialty stores do carry a limited variety of the seeds but if you want unusual seeds you will have to buy on the Internet. Look for reputable companies that have been in business for a while and that carry organic seeds. The Food and Drug Administration has posted a warning that you can get salmonella and other food born illnesses from sprouts. While there were a very few cases of salmonella among consumers that bought sprouts all ready grown, there have been none from home sprouted seeds. Buying organic seeds that is sold for sprouting purposes virtually eliminates these risks. Sprouts can add nutrition and variety to your meals. When you grow your own sprouts you not only save money, you are doing great things for your body and the environment as well. Whether you are a traditional vegetarian or on a raw food diet, sprouts are a key ingredient for your healthy lifestyle.